3KCBWDAY6 I have a skill set? 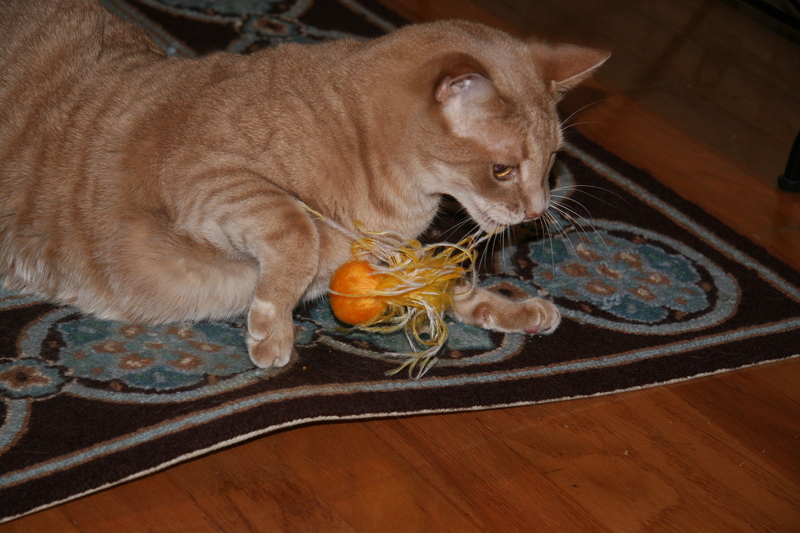 Today’s topic for Eskimimi Makes 3rd Annual Knitting and Crochet Blog Week is Improving Your Skill Set. I know it’s late in the week for some to look into this, but I encourage you to check out a few posts from other bloggers who have entered each day’s topic by posting. All you have to do is type 3KCBWDAY6 (for today’s entries) into your search engine and click on the posts that come up. Yesterday’s topic was “Something Different,” which encourages the blogger to post in a new and challenging way that they’ve never tried before. I found some very cool and creative posts. I even went so far as to nominate Dinkyflower to be the winner. If you care to vote for your favorite, here’s Eskimimi’s form for Day 5. Today’s topic is about reflecting upon your skill set. Mine is very small, I’m afraid. However, with these seven skills, I can sure spend a lot of time working on projects. Last night was our 4th meeting and we sisters were going strong! Oh, sorry for the sorry picture from my camera! 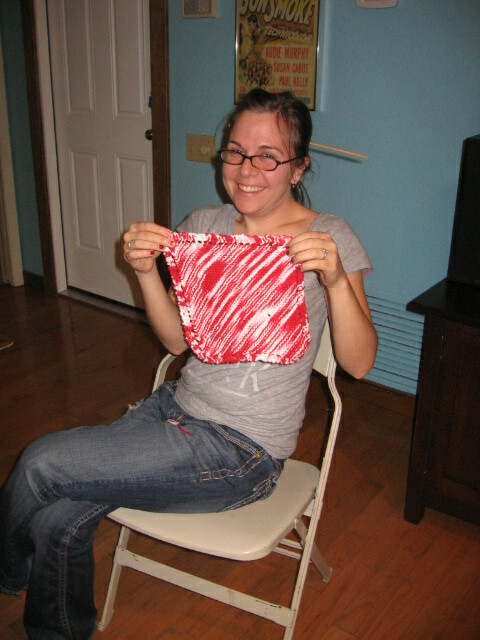 This was Tiffany’s first knitting project. completion? It should be displayed in a glass case! 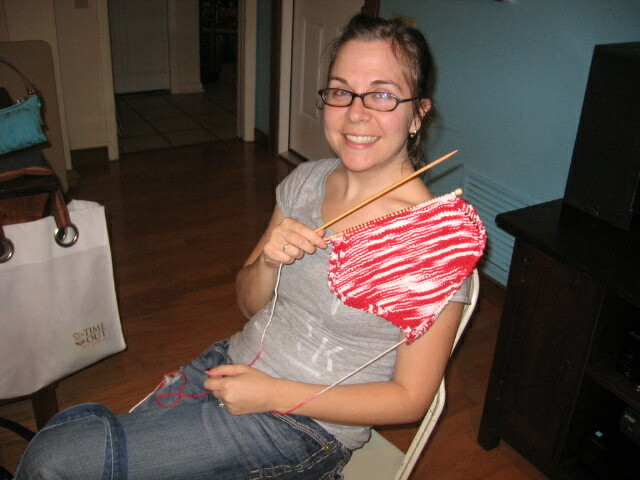 Beth is also a novice knitter; she is working on a — a scarf? I forgot, anyway, she got quite a few more rows in past what you see in the pic before she left. 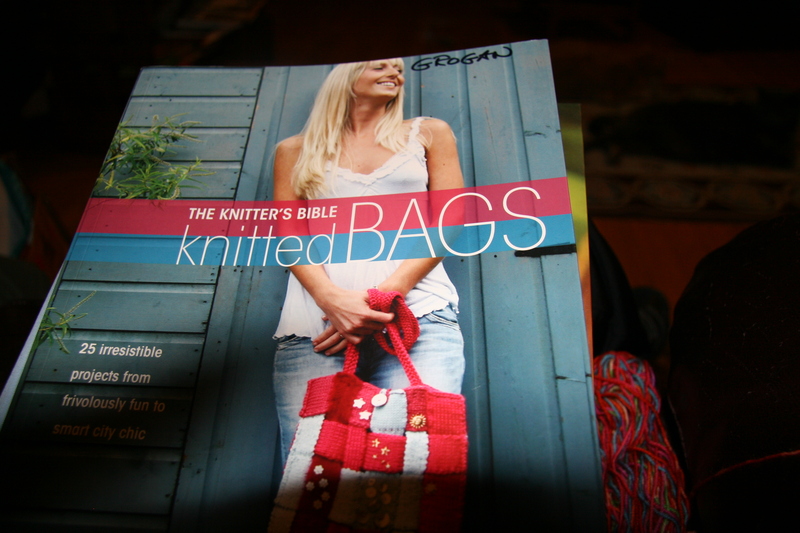 Lisa is not a novice but is extremely knowledgeable about knitting. On Wednesday nights, she comes to share her expertise with us while her 5 kids are home doing homework! 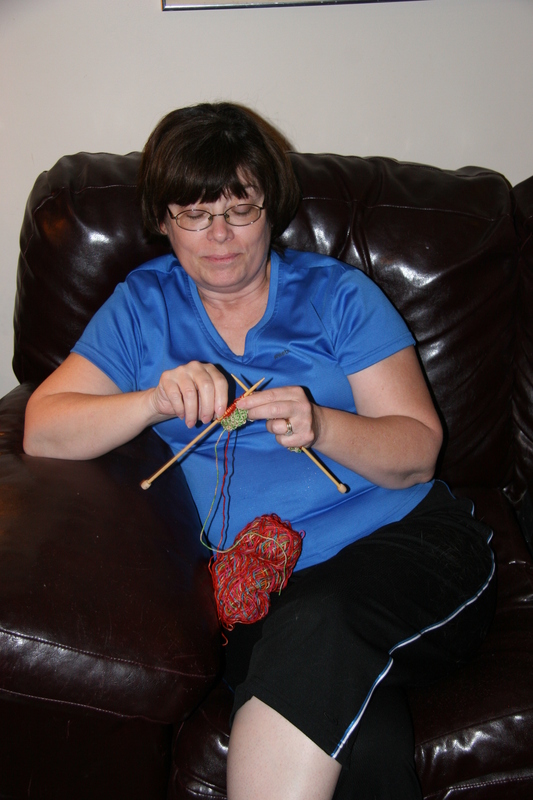 Lois is not a novice at knitting. After a lifetime of the English method, Lois learned –at this meeting–the Continental method from Ethel. 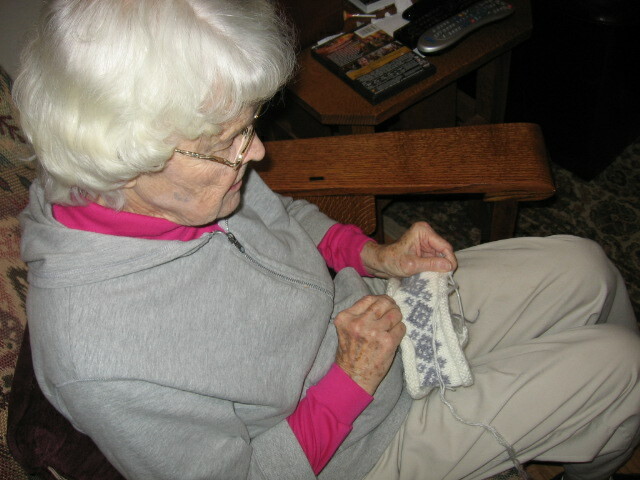 Ethel has no doubt that Lois will soon become proficient at Continental knitting as well as English! 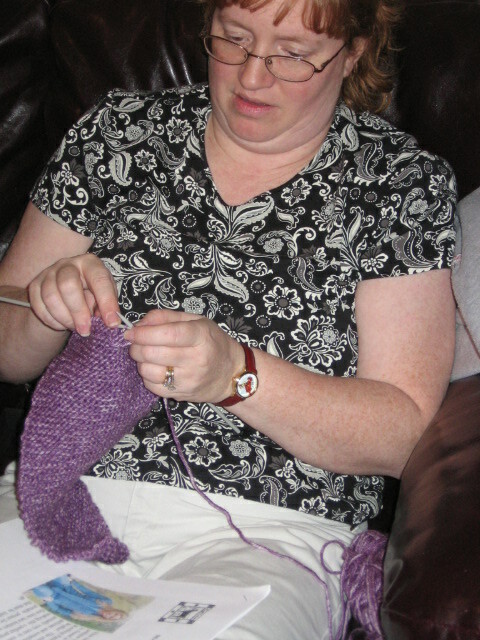 Tricia is making progress on the knit scarf in beautiful shades of purple. 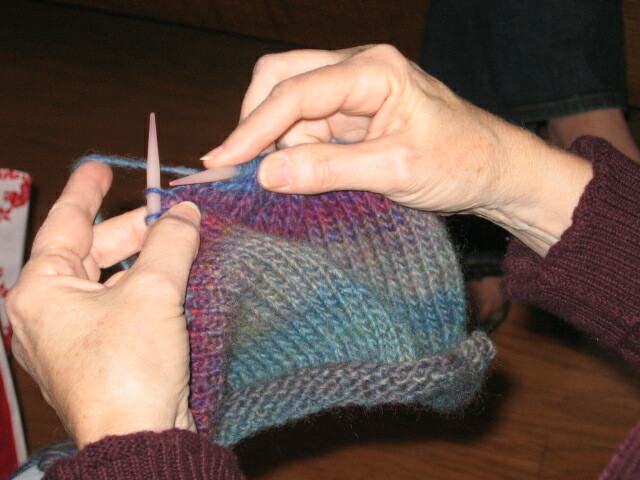 Tricia is a novice, who learned to knit at the beginning of all this. We chose Wednesday because her husband has a video game playing gig that night of the week. Good for us! 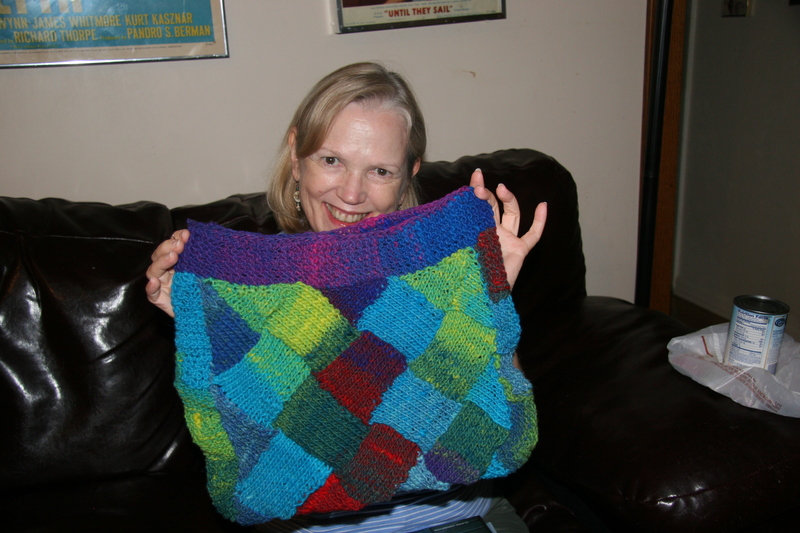 Trish is mastering the knit stitch and has many ideas for future projects! 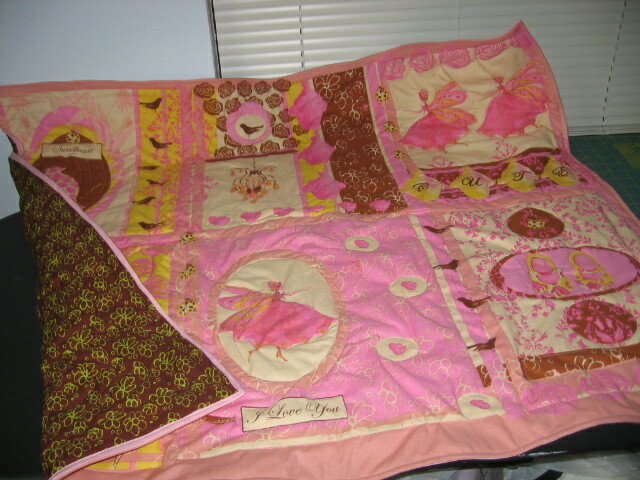 Maybe we can get some pics of her quilts…. Ethel is the ring-leader and teacher of the group! 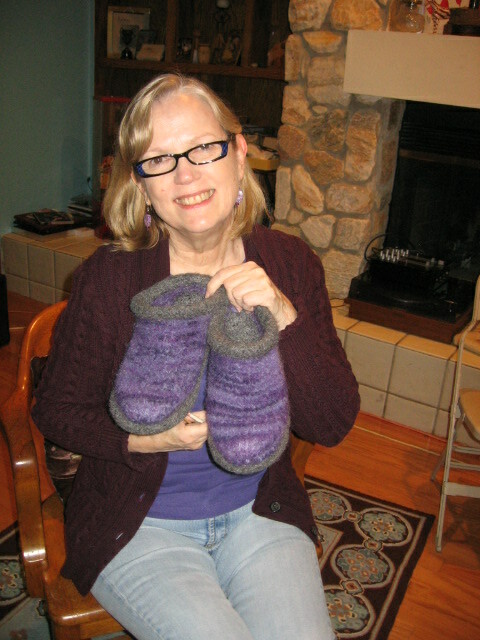 She’s showing her recent project, felted clogs! 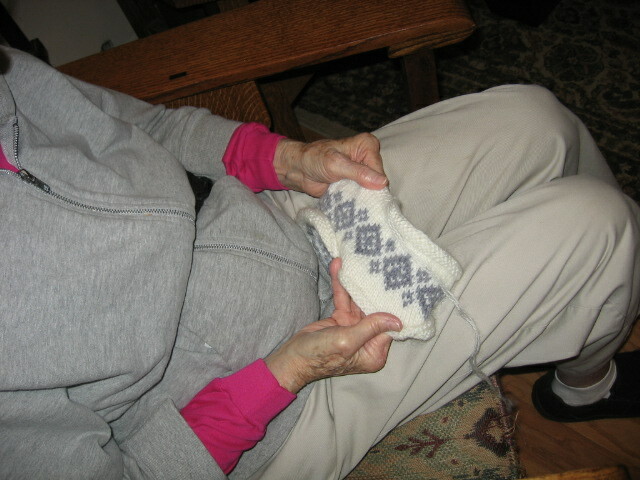 After knitting, washing and felting, she had to wear them around wet (in beastly cold weather as it turned out) so they would mold to the shape and size of her feet. Which they did, beautifully! We saw a clog someone had put on display at the local yarn shop that didn’t look nearly as perfect as these. They are magnificent! Ethel’s new project is a sweater to match the ruffled scarf that she made last week. Gorgeous! 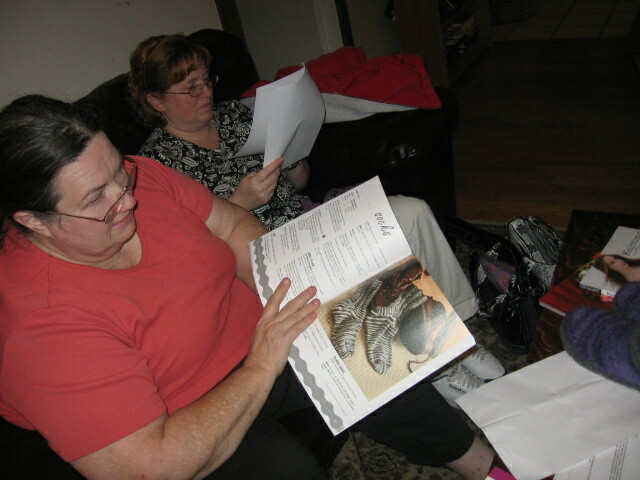 of conversation about knitting history; a plus for me because I like to look at the “big picture” when I get into something. 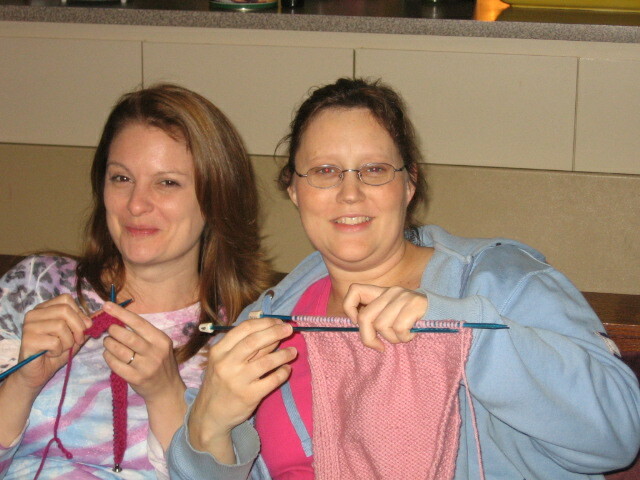 I started knitting when I was little, but haven’t re-tried in about 45 years! 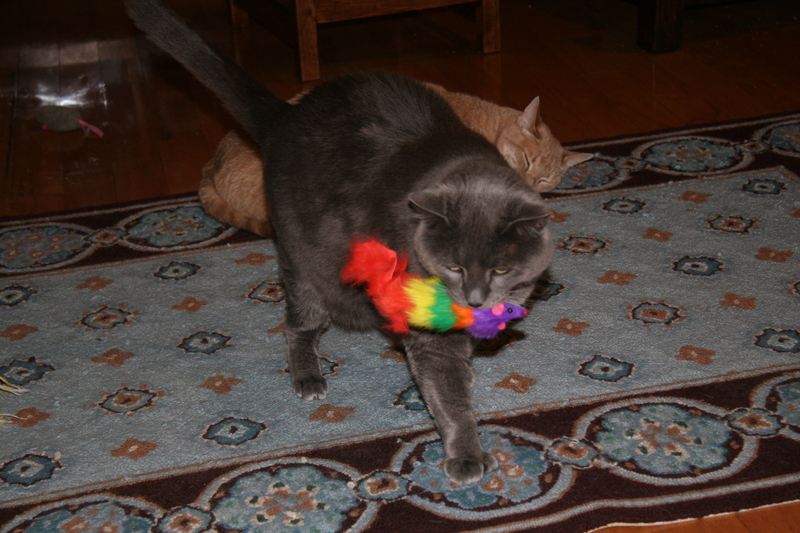 Then, with Ethel’s help, I found that what I was doing was not knitting or purling at all! What was I doing? 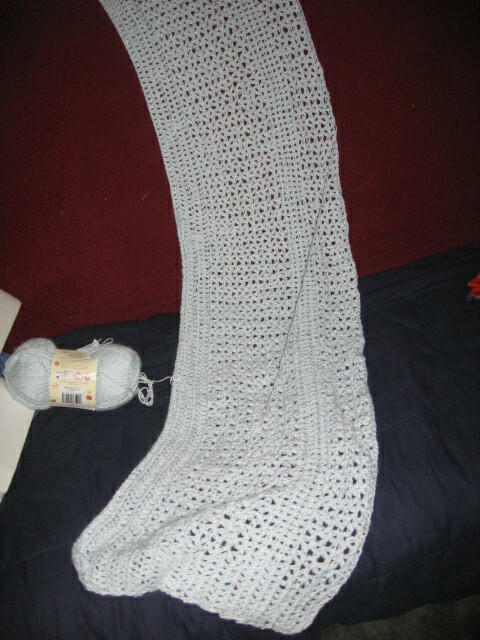 Here’s the crocheted blanket I’ve been working on and have about 1/3 of the way finished. 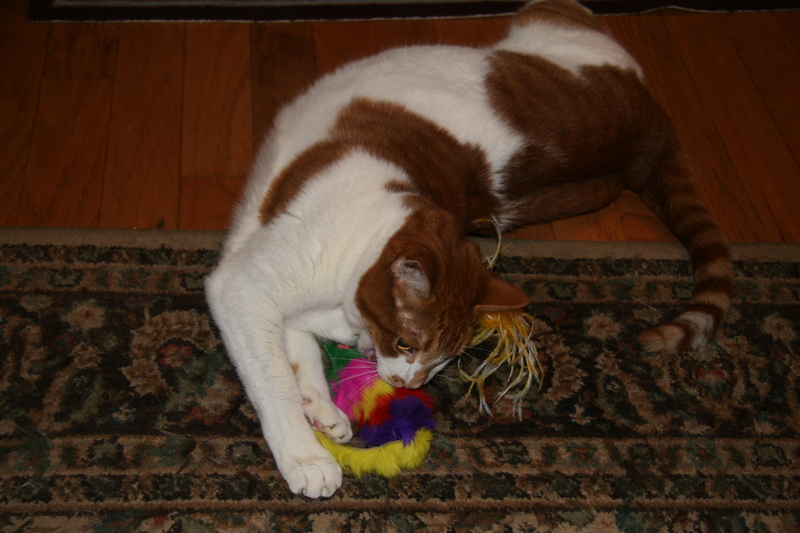 Yes, I’ve started a knitting project too but I’ve ripped it out over 50 TIMES! I guess it is counting that’s the main prob for me. I couldn’t get the hang of making change when I tried to get a job at McDonald’s as a kid, either. 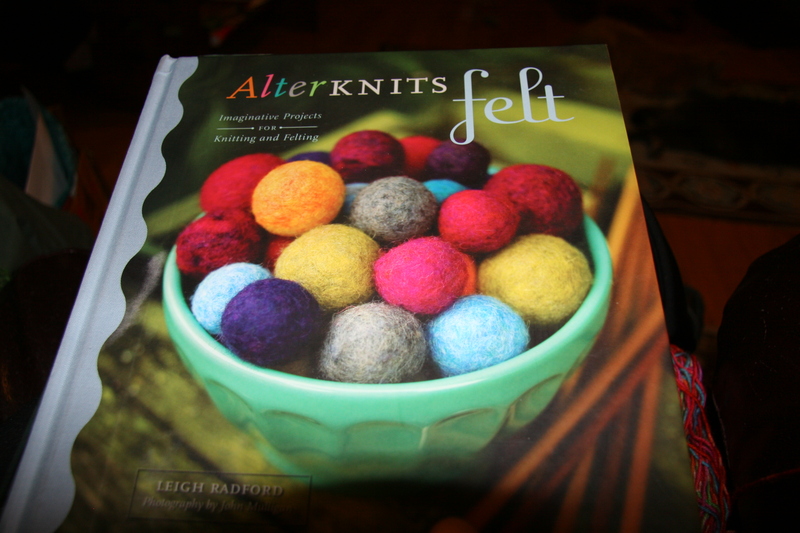 Next post, maybe I’ll have some knitties to show! Wow, Tiffany finished her project in class! It looks good, too!